Through policies, people might understand the way they are governed and the impact of the government on their welfare. The Police of the Republic of Mozambique (PRM)1 is a Mozambican Organization with the main goal of guaranteeing the maintenance of order, security and public tranquillity. This requires the enactment of policies and the transformation or application of these policies to achieve goals. This is done to satisfy public expectations, such as ensuring stability, safety of people and good services, and freedoms from a government. The existence of principles in the police entities helps to reduce the use of discretion serving as guidelines and procedures for police officers which intend reduce the arbitraries. And also, it helps performance and administrative control over the police officer as well as enhances motivation. Taking the Community Policing (CP) in Matola- an industrial city in the South of Mozambique - as a case study, this research attempts to answer the question how principles on crime prevention policies are taken into consideration by the PRM in their daily activities and why they suddenly vanish without prior information and general consensus as when it was instituted. 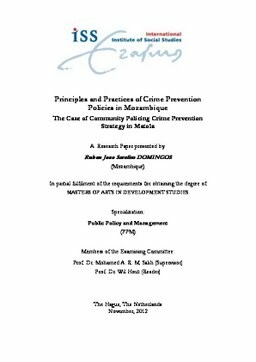 This was done by analysing deeply the principles of the CP and practices exercised by both the community and the PRM. The findings demonstrate that both the PRM and the CP members act with lots of discretion. They use experiences as their guiding principles for policing. Investigation and information are not thoroughly carried out demonstrating a clear contrast between the principles of crime control policies and their practices. This is attributed to the lack or inadequacy of resources and poverty, which influence the behaviours of both those responsible for crime prevention and the beneficiaries. Moreover the existence of different kind of individual frictions within the PRM as well as in the community translated in “silent manifestation” adds up to the flavour to the disappearance of many policies such as actual stationary stage of Community Policing. Thesis Advisor Salih, Mohamed A. R. M.